Week 5 of the #ScrippsSummerChallenge proved to be a great one. This past week, members were to make a new LinkedIn connection with a professional in the city they want to intern or work in. Participants each chose a professional from a different city, which really shows the diversity in interests within our chapter. We even got some praise from the University of Alabama! 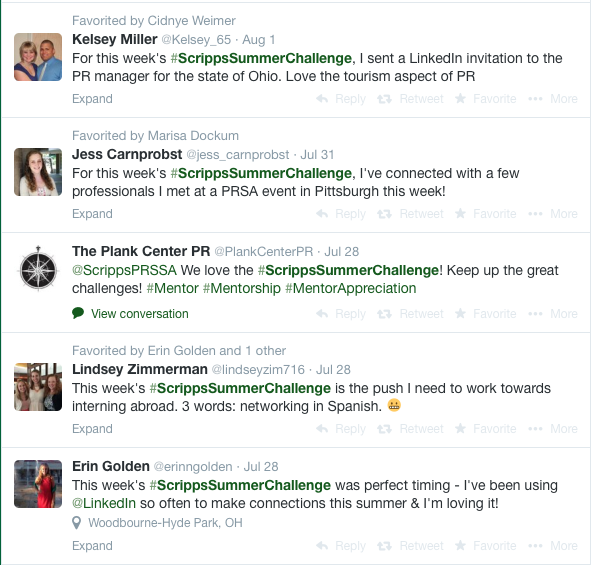 The Plank Center, an international resource for practitioners, educators and students who are passionate about advancing their careers and the public relations profession, gave us a shout out and commended us on our success with the #ScrippsSummerChallenge. Great job to those who participated this week! DONT FORGET: the two members with the highest participation throughout the #ScrippsSummerChallenge will win either 50% off their next spirit jersey or a PRSSA Tervis Tumbler. BE SURE TO JOIN IN ON OUR NEXT #SCRIPPSSUMMERCHALLEGE THIS WEEK!